Owners have the most to lose financially when worker challenges are present. While contractors have the final responsibility to recruit, hire, train and retain workers; owners ultimately bear the cost. Active engagement will improve the owner’s bottom line and the industry overall. 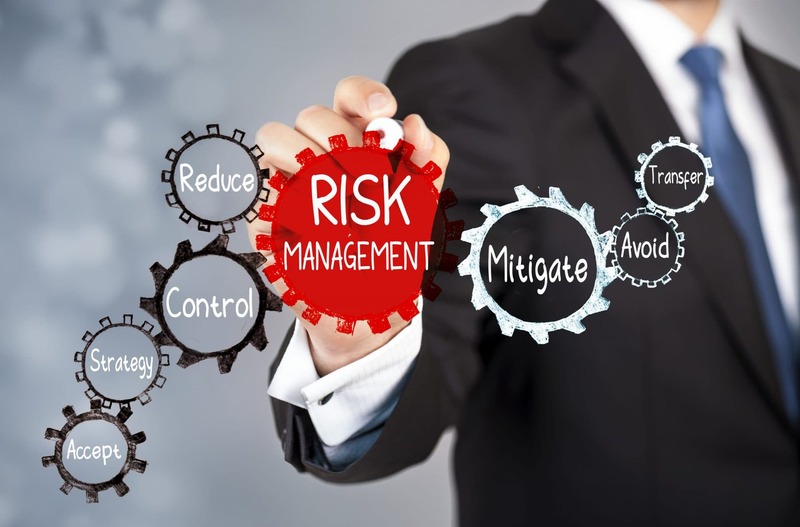 Taking action early in the project planning process enables the owner to control cost and influence what contractors do, just as it has for safety. This recommendation has been reaffirmed multiple times since by CURT and most recently in August 2018 (RT-335) by the Construction Industry Institute. Why is the LRM necessary? Chronic shortages of skilled labor are increasing costs and schedules and resulting in lower quality, more accidents and missed project objectives. Current forecasts indicate skilled labor shortages will increase with a growing economy and current industry age distributions. Contractors, as the employers, need to take the lead in developing new skilled resources for current and future projects. The recommended role for owners is to prequalify the contractors for all their projects based on WFD capability. 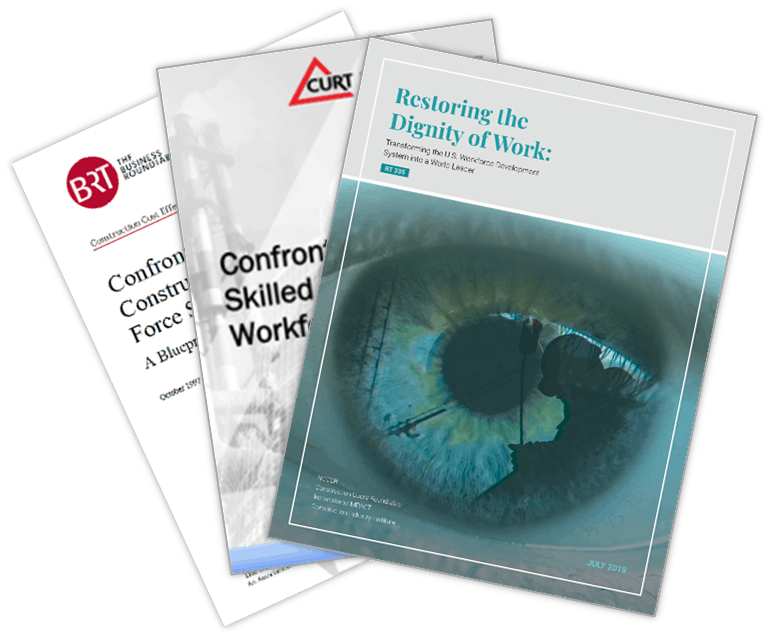 Construction workplace safety is a primary concern and a cultural mindset for most companies, but consistent, effective workforce development and training has not been effectively addressed. The result is a construction industry significantly impacted by skilled labor availability challenges – not the availability of workers, but of the skills required to execute projects. In the past, when the owners declared safety to be a core value and business imperative, key contractor selection safety metrics were established, safety improvement innovation was unleashed, construction sites and projects become safer, and zero safety incidents became achievable. Owners understood the importance of safety for their own operations and most already had strong employee safety programs in place. What was needed was a standardized, institutionalized process for the industry as a whole and labor providers in particular. 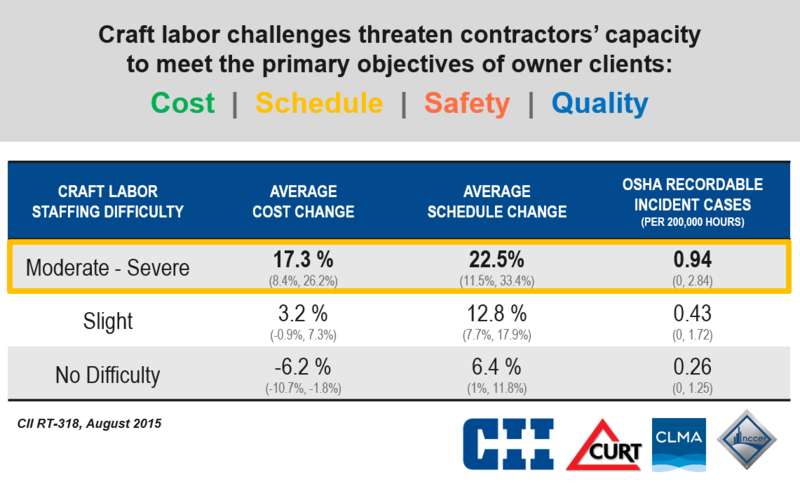 The recommendation to prequalify contractors for safety performance originated with the Business Roundtable (BRT), was based on the 1982 Construction Industry Cost Effectiveness study (CICE) and was predicated on demonstrated real cost savings, in addition to avoiding accidents – E.g. “Safety Pays”. Avoided accidents reduced the direct cost of each accident including costs of emergency management, staffing, administration and investigations. Similarly, when owners make workforce development a core value and a business imperative, the consistent development and deployment of effective workforce and training programs (and related metrics) will follow. CII research empirically demonstrates up to a $3.00 ROI for every dollar invested in training (RT-231). This will enable all stakeholders to lower cost and recoup their investment as it did for safety. Skilled labor challenges threaten the ability to meet project objectives like safety, cost, schedule and quality. Recent research (RT-318) empirically demonstrated that labor shortages cause an increase in safety incidents, and other project objectives, directly proportional to the severity of the shortage experienced. Owners are in the unique position to lead, make workforce development a real priority, incent the right behavior and lessen/prevent avoidable project risk. 2019Jan31 – Is the skilled labor gap a threat to operational safety?